As I approach the due date of my second child I have been looking back to my wedding day and the main comment from everyone was "we can't believe you did all this with so little stress" - and it was true, our wedding day was one of the least stressful days in our lives! Leading up to the day we did very little planning as to us getting married was the most important thing, decorations and such like were secondary concerns. Although we did not do it on the tightest of budgets we did get some greats deals along the way and I would imagine our wedding was by far cheaper than the average wedding and so I have joined Ocean Finance's "Something Borrowed, Something Blue" campaign to share with you some of my money saving tips and best memories. This is what made us choose the venue for our wedding, which just so happened (unbeknown to me), the same venue that my parents got married many moons before. We found a deal online that means we got the venue, wedding car, bride's bouquet, photographer (hundreds of pictures, wedding photo book and all discs on a disc watermark free), wedding ceremony and three course meal for 60 guests, evening venue for up to 200, wedding compare and table decorations, first drink for all guests, bridal suite and two rooms for family (B&B), all for one set sum (there may have been more but it was over two years ago now). The cost was cheaper than had we just booked some venues for the ceremony and evening without all the added extras. 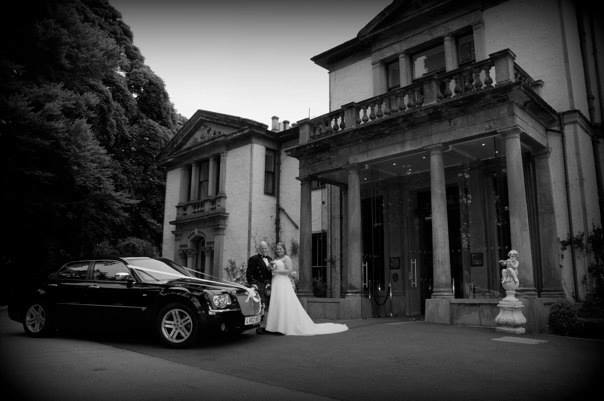 When we went into the hotel we found that the deal was for weekday weddings but because our date was free (it was 2013 so it seemed people were avoiding this year to get married due to superstition) we got the deal for a Saturday saving ourselves over £1000. They say the average cost of a wedding os £22,000 (how?!?!) and this deal was for £5000. As well as saving money it meant we had to do next to nothing when it came to organising things as our wedding planner did it all for us. Fantastic. Okay I will admit I am very bad at looking after my hair so hairdresser appointments are a bit alien to me but as it was my wedding I had to get my hair done professionally. I will also admit that the ladies in my office were having heart attacks as I had not even looking into getting an appointment when I only had two days until the big day. So I just went ahead and booked an appointment, not saying I was getting married, asked for the cost (£25 I think) and booked it. I do feel a bit sorry for the hair stylist who made the mistake to ask me if I had a special occasion when she was doing my hair - when I said it was my wedding day she looked like she was going to pass out. Now had I booked this as a bridal hair appointment the cost would have at least doubled if not tripled just because I said the special wedding word. Don't say it so you don't have to over pay. 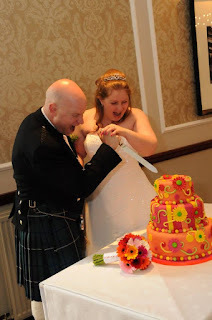 When it came to our wedding cake I had an idea in my head about what I wanted the cake to look like but it was going to cost £500+ so I asked for recommendations for any local people who could do it. Luck would have it that there was someone who I knew through my work that made cakes and she made the most spectacular cake for just over £100. It looked identical to the design I had given her. Was made to the flavours we wanted (chocolate orange and vanilla and raspberry) and was a proper head turner. 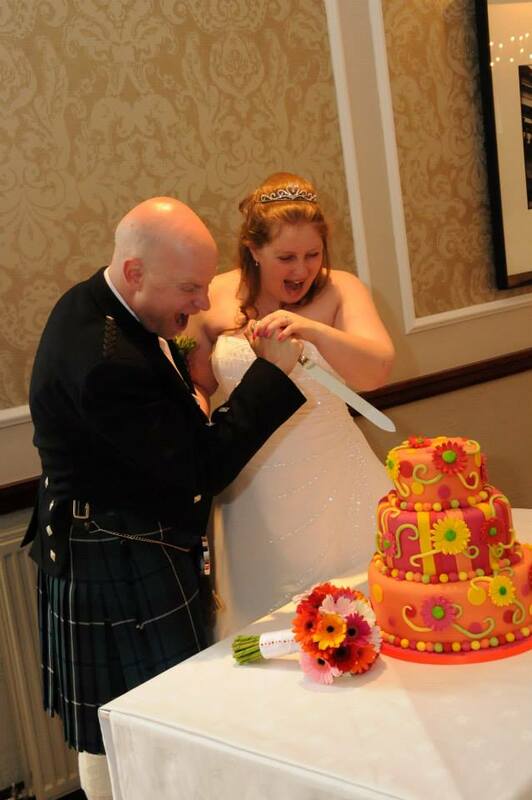 The owner of the chain of hotels had been at our hotel that day and commented that he had seen thousands of weddings but never a cake so bright! And it matched my flowers so well! I also needed my dress altered and again got someone local who altered it for me for only £50 (I would have given more but she refused to take that much until I made her). Our package deal only included the brides flowers and for additional bouquets you were £50+. So on the morning of my wedding I nipped to Tesco and we bought a selection of bouquets from there which we then split up and made into bouquet for the two bridesmaids and flower girls. In total the flowers would have cost far less than that of a professional bouquet and they looked perfect. How can you possible just choose a few memories from such a great day? It is so hard. I think the fact that everyone got up to dance in the ceilidh was fantastic, we never struggled to fill the dance floor all night. Giggling through my vows. Embarrassing at the time but so funny now. Just got told that it just summed me up. I just forgot what I was meant to be saying. We still laugh about it to this day. Knowing that in that day we were the only ones that knew we were expecting a baby (I was 8 weeks pregnant at the time) and no-one even noticed I was not drinking. Being called Mrs for the first time. Love it!